Dragon leaps through the portal home and is surprised to find himself in a snow covered Chicago and wonders if his original reality has suffered from a nuclear fallout or some other incident. He looks at a newspaper and realizes that he has travelled back in time. Chelsea Nirvana is about to murder Ann Stevens whilst disguised as Dragon but as she is about to open fire, the woman drops dead with an entry wound through her forehead. Ann Stevens is left traumatized by the whole ordeal and Dragon tries to explain just what is happening. The holographic projector harness is deactivated to confirm the story about Chelsea wanting to steal her powers to become the new Mighty Man. Dragon suspects that She-Dragon sensed that this was the moment when his life started falling apart and wished to help him repair matters. The Chicago Police Department is called in and Dragon reveals that he had no gun to shoot Chelsea; he chewed on a dime and spat it out through his victim’s head. Frank Darling and Ann listen on as Dragon tries to explain how he had spent a couple of years in another reality before being sent back into his own past. Alex Wilde arrives at the crime scene and Dragon is overjoyed to see her alive again. This confuses his friend and Dragon agrees to full explain just what has happened to him. The news that Jennifer Murphy is still alive upsets both Ann and Alex as they had both had hopes of dating Dragon. He apologizes to them about leading them on but he had no way of knowing that his fiancé was still alive. Eager to still help Dragon out, Ann offers to accompany him to Florida so that She-Dragon can be rescued before she is forced to help bring over a new DarkLord. Mighty Man and Dragon soon arrive in the Dark-Land region of the Florida coast but before they can reach their missing friend, Dr. Nirvana arrives on his Power Chair with an army of robotic minions, the Absorbanoids. 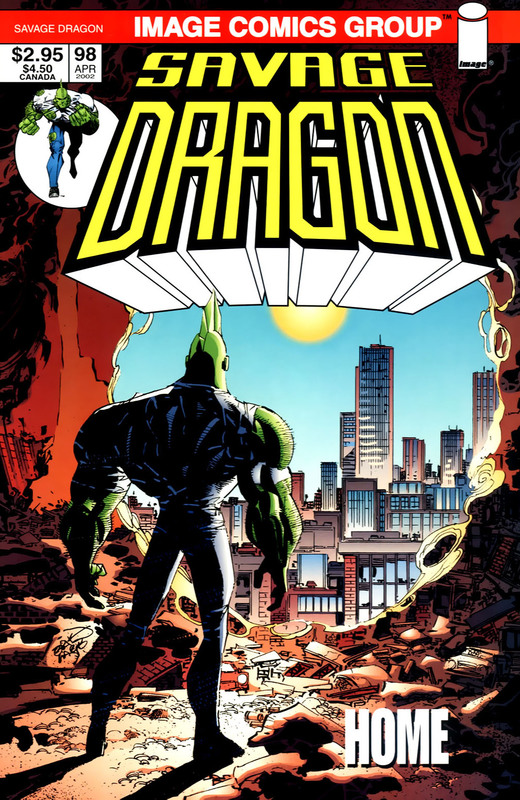 Dragon realizes that when he killed Chelsea that it enabled her father to survive to continue his quest against Mighty Man. The Absorbanoids overwhelm their target and commence draining his energies so that it can be passed along to Dr. Nirvana. Dragon tries to interfere but Dr. Nirvana merely orders his agents to absorb his power too. This battle attracts the attention of the Demon Dogs who swarm out to attack all of the intruders to their territory. Their weapons overload the Absorbanoids and cause them to explode in a powerful blast. Dr. Nirvana celebrates his apparent victory before he dies from his injuries as Dragon notices the corpses of She-Dragon and the Eternal Youths lying around him. He crawls over to the remains of Mighty Man and connects his wrists together. Some time later, Dragon awakens in Hillman Hospital where his counterpart from the past is waiting to interview him. This version of Dragon confirms that Ann Stevens survived the explosion thanks to Mighty Man being transformed back to his mortal form. Dragon attempts to explain about his trips through realities and warns of DarkLord’s plans. He is escorted to the portal back to the other Earth and before he passes through, Dragon gives some final warnings and advice about how to avoid the heartache he suffered through.